After yet another therapy session during which I complained of my usual grievances — not having enough energy or time, failing to accomplish everything I should — my therapist suggested action. I was caught off guard. I didn’t want to be actionable. Why should I be? Isn’t the purpose of therapy to lament woes in a safe environment? The truth is, I just wanted to complain, probably forever. “Maybe ‘not enough time’ is an excuse,” my therapist told me. She had never accused me of making excuses before. 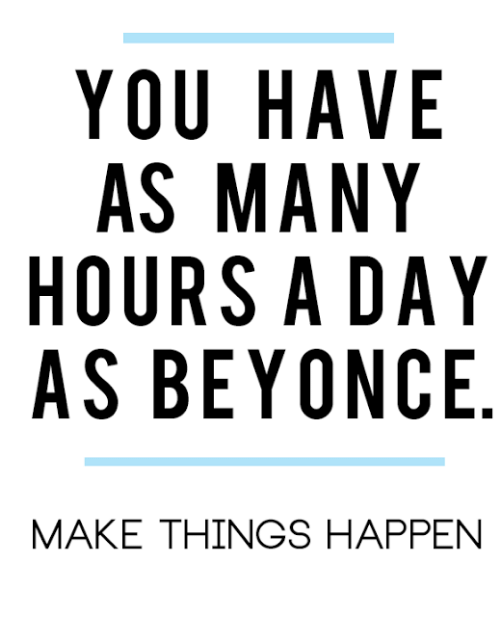 Then, I thought of something more trivial: That meme about how Beyoncé has as many hours in the day as the rest of us. I thought, I’m totally making excuses. Truthfully, I’d been looking for more medical solutions. You know: Was it time to change antidepressants? Did I need a B-12 shot? Should I get tested for mono? “No, not a to-do list. A schedule.” Then she explained that I was to outline my day by the hour, by the half-hour if I had to. A to-do list was too easy to bypass. 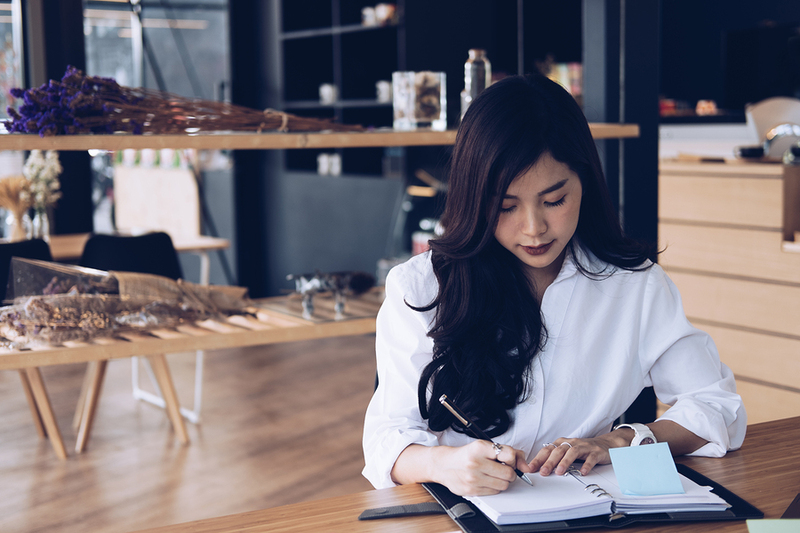 After all, I’d already been writing them, and yet I found myself parlaying at least two or three of the tasks I didn’t get to over to the next day. Those tasks had a way of carrying over, carrying over, until weeks went by and the same dreadful tasks were still undone. I was skeptical, but agreed to the experiment. “Oh, and you have to include your meals, too,” she added. I had a habit of forgetting to eat. The outlining, she reasoned, would help. It was supposed to help regulate eating, sleeping, exercise, and time management. Jeez — therapy has deadlines now, I thought. I woke up the next morning at around 8 a.m., my dog pawing my face to let me know she was ready for her walk. My therapist had said to include everything, even walking the dog, so after our half-hour trek, I sat down and began scheduling. 8 a.m.: Wake up, walk dog. 8:30 a.m.: Make the day’s list. What did I need to do next? Well, I needed to take my vitamins, have coffee, do my skincare routine, and brush my teeth. When I got to 10 a.m., I wrote in tasks I had been putting off. 10 a.m.: Write the article I’d been avoiding because it had a high word count. 11 a.m.: Write the other article I’d been avoiding… because I am an avoider. 1 p.m.: What was that thing I had to include again? Oh… Lunch. When I crawled into bed that night, I had an acute feeling that I had accomplished many more tasks than usual. All the articles I was supposed to have written were ready days before their deadlines. I had a handle on my schoolwork by divvying up readings into manageable time frames. After vigorously outlining my days, I noticed: I had a television problem. All those sessions I had complained about time? I’d been watching anywhere from four to seven hours a day, Netflix or reality shows on in the background while I “worked.” Once I scheduled out my time, I didn’t include TV. With all these to-do’s on my schedule, I had no time for TV, which illuminated just how much of it I had been watching previously. I also wasn’t making time for meals, as my therapist had noticed. My eating habits prior to outlining were rushed and based on convenience. Now, with eating scheduled in, I have become more intentional with meals. They’ve become cherished moments to look forward to. Sure, there are usually one or two tasks I desperately do not want to do. When making my daily outline, I’ll leave them for last. But the outline causes me to take note of it and ask myself why I’m having such an adverse reaction to that task. I’ve learned to arrange the “most dreaded” task first. With that out of the way, my day gets easier. The outline was supposed to make me a better grad school student, a better writer, a better adult who actually takes care of herself. Outlining has helped me reclaim my days, organize my priorities, and restore my energy. I’m eating healthfully again, waking up at a decent time, and going to bed at a normal time. It made me a better student, worker, and most of all, a person who understands the value of an hour. Stephanie is a chai tea enthusiast with a special penchant for telling apart the Sprouse twins. 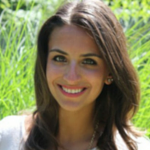 She works as a social media editor in the magazine industry and blogs about all things lifestyle at StephOsmanski.com. Her words have been featured on Seventeen, USA Today, Parents, HelloFlo, J14, and more. Follow her on Instagram and Twitter.